Yo-Yo Club is completely free; all you need to bring is your yo-yo and a great attitude! This FREE club for all ages meets weekly at Central Park in downtown Grand Haven. 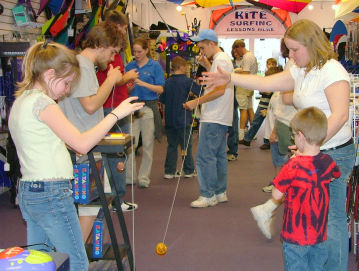 Boys, girls, and adults help each other to grow their yo-yo skills and earn prizes as they complete levels from the official Yo-Yo Club trick sheet. Start with basic tricks such as Sleep, Walk the Dog, and Forward Pass, and move on upward to string tricks that will amaze. Each level has multiple tricks, and once these are mastered the student earns a prize and moves up to the next level. Why are the club and prizes free? Skills associated with yo-yoing are positive life-skills that we at MACkite are all about. We believe that wholesome play and fun will improve the fabric of poeple's lives. The hand-eye coordination skills, confidence as club members progress to new levels, and socialization skills from playing with others are part of what we strive to provide.